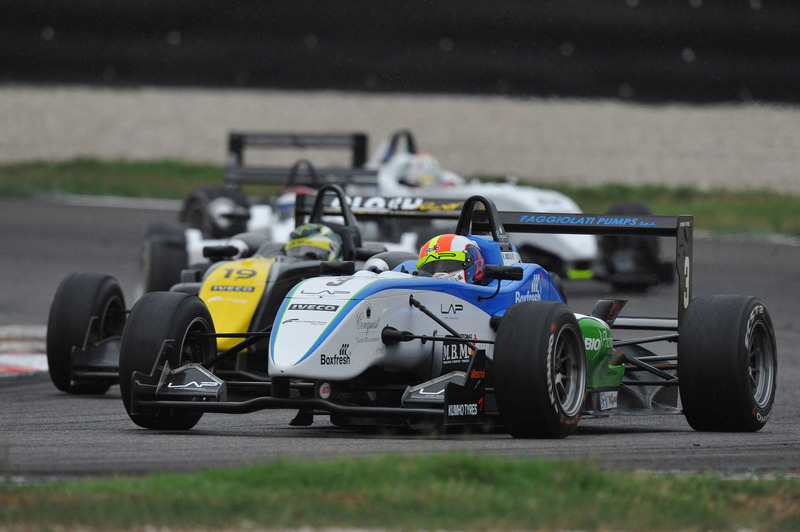 04/09/2011 - Maxime Jousse obtained the first victory of the season in the Italian Formula 3 Championship at the end of a thrilling and tight race due to the rain wetting the Adria racing track. All started on dry tyres, the protagonists of the tricolored series produced a sequence of emotions and the French of BVM-Target managed to win. Second behind Victor Guerin (Lucidi Motors) since the beginning, Jousse did not procrastinate to move the attack that resulted in his success. The Brazilian had to fight with Kevin Giovesi (Lucidi Motors) and managed to have the best of the Milanese driver. The Roman Eddie Cheever (Lucidi Motors) was fifth behind Brandon Maisano (BVM-Target) and proceeded Sergio Campana (BVM-Target) who, thanks to the sixth place in both races managed to keep the classification lead with just a point to Jousse (first of the rookies), while Raffaele Marciello (Prema Powerteam), forced to an error in the final laps, ended tenth and now is 7 points from the top of the classification. Andrea Roda (Prema Powerteam), was again one of the protagonists and ended seventh ahead of Edoardo Liberati (Team Ghinzani) with the latter that, after keeping the third position, was pushed down the field while Federico Vecchi (LineRace-CO2 Motorsport) obtained a very good ninth place after fighting for the top positions at the beginning. The next round of the Italian Formula 3 Championship is scheduled for 18 September at the circuit Vallelunga Piero Taruffi near Rome.